Mmmmm….Yummy! Rich, creamy, tangy and hearty. This soup is a what comfort food is all about. Last week when the weather suddenly became cold (warm again now!) 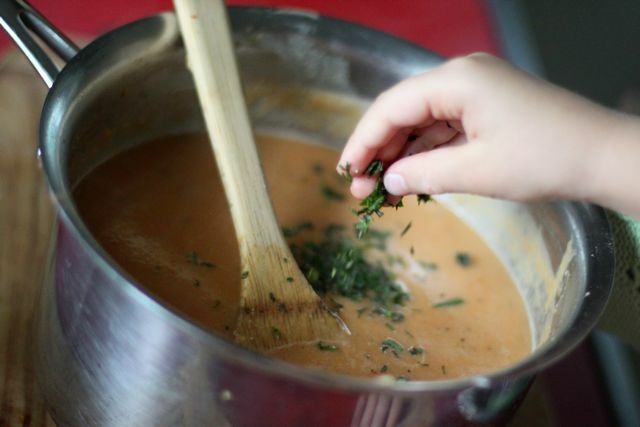 we enjoyed making Tomato and Red Lentil Bisque. I love soup and it is definitely a thing to look forward to with cold weather, and so along with premature fire making, we made soup early too. 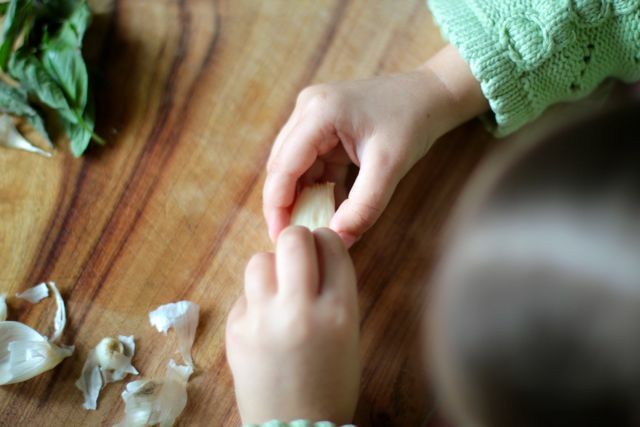 Elle is my official garlic peeler, she will sit and carefully peel the garlic paper from the clove – and then ask to do another one, and another, and another. 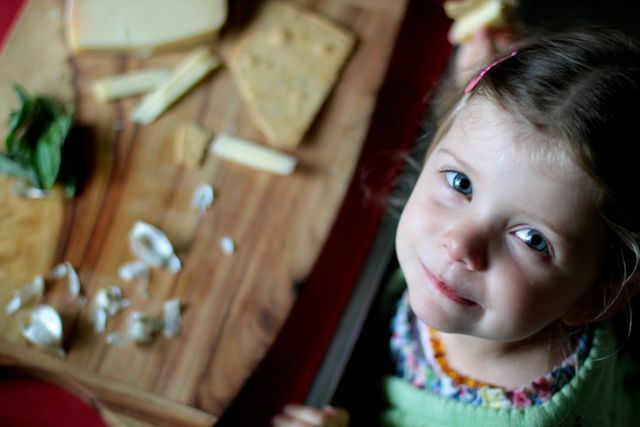 Both the Girls enjoy cooking, and each seem to have their favorite tasks. 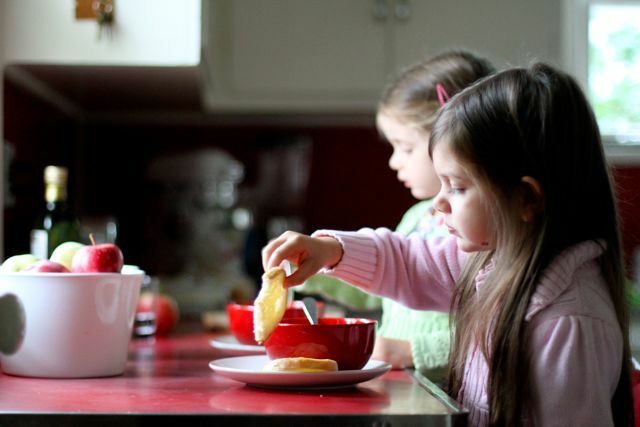 By having them help me cook our evening meal it keeps me happy as they are constructively occupied, and it also means they grow up learning to cook – something everyone should do. 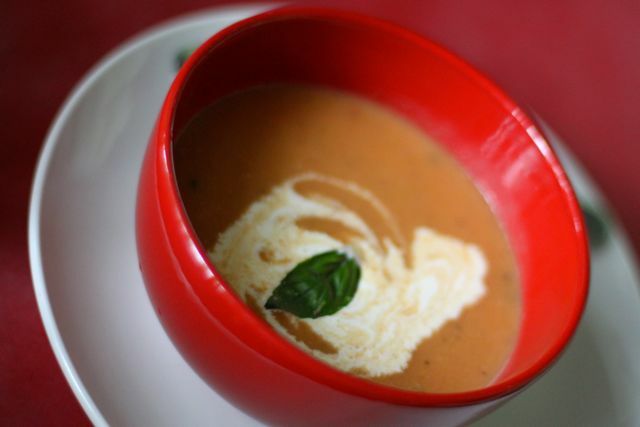 I want to share this recipe with you – but please keep in mind, I made this soup up as I went along and so I am not exactly sure of the quantities. All measurements are approximate so you will get the gist, but remember to use your own judgement. I was inspired to make a tomato soup as Nina gave us a large succulent tomatoes from her garden. The big fat juicy tomato on our window sill was begging to be roasted. 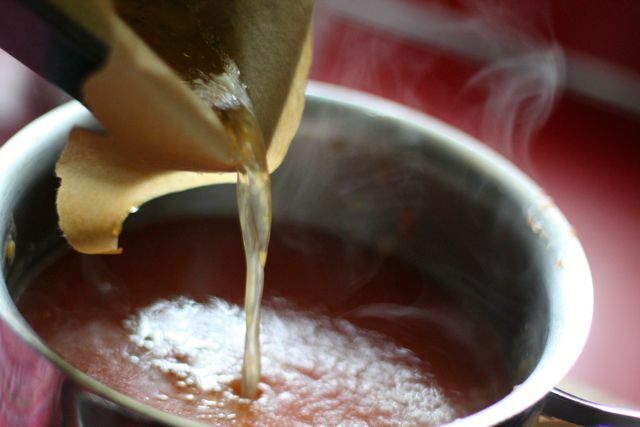 I like homemade roasted tomato soup very much, but to feed the whole family tomato soup it takes a lot of tomatoes. I had only five large tomatoes, which is not enough, so to extend the soup I decided to add red lentils (here comes my lentil plug), lentils of course give us protein, and so we could easily eat them every day. Lentils are good for so many reasons, but mostly we eat them for protein and iron. Lentils are a small but nutritionally mighty member of the legume family, they are also a very good source of cholesterol-lowering fiber. Not only do lentils help lower cholesterol, they benefit in managing blood-sugar disorders since their high fiber content prevents blood sugar levels from rising rapidly after a meal. Lentils also provide good amounts of six important minerals, and two B-vitamins—all with virtually no fat – unlike meat! (spoken like a true vegetarian!). Go lentils! So here is my tasty recipe, a great way to use up those summer tomatoes, and enjoy a health and balanced meal! 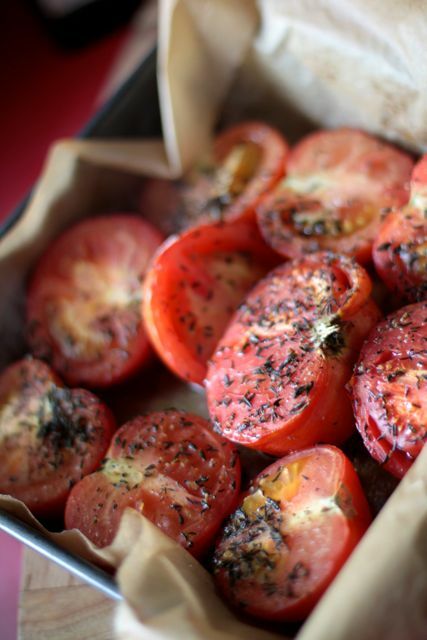 Wash and halve tomatoes and put them in a baking dish – I line the tin with baking paper. Drizzle with olive oil, sprinkle with fresh thyme, salt and pepper. Bake at 420˚ for about 20 minutes, or until the tomatoes are looking nicely roasted. 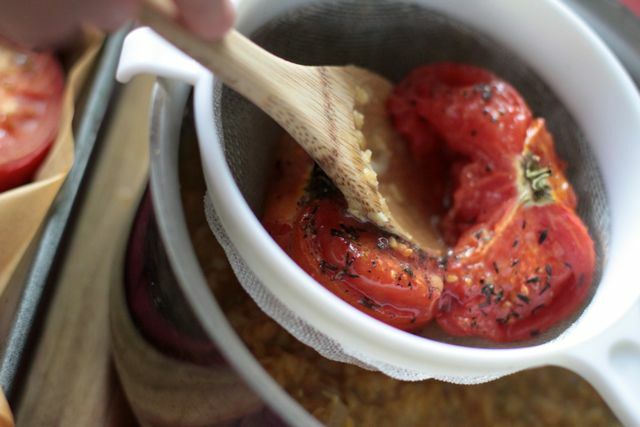 While tomatoes are roasting, prepare the lentil soup base. Dice celery and onion. Sweat the celery and onion with olive oil in a medium saucepan. When it is slightly golden, add a cup of red lentil and 1/2 to 3/4 cup of water and the bay leaf. You only need enough water to cover the lentils just – you don’t want this to be to wet as when you add the tomatoes it will make it more soupy. 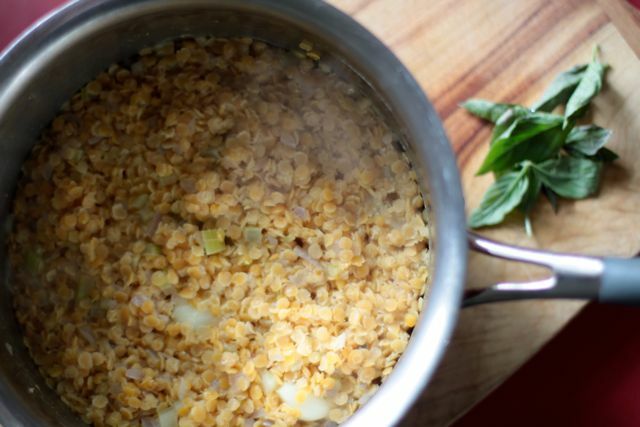 Let the lentils cook covered for about 10 minutes – or until tender. When the lentils are coked, most of the water will be absorbed. at about the same time as the lentils are cooked the tomatoes should be roasted. 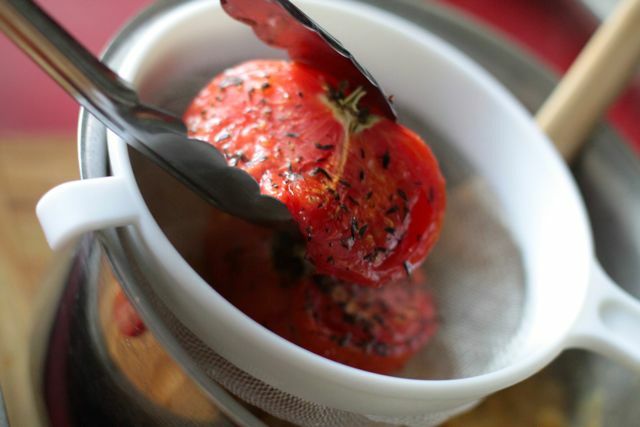 Using a sieve, press roasted tomatoes into the lentil base. You are basically juicing the tomatoes be pressing out the liquid. 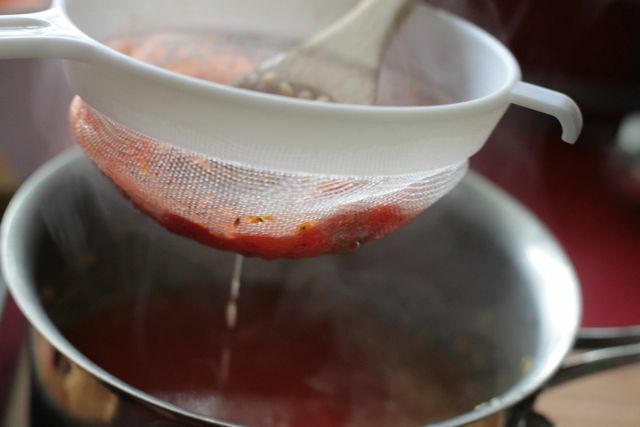 By doing this you are able to discard the skin and seeds and avoid an overly piquant flavour to the soup ( I would use a metal sieve if I had one – but for now I am still using this horrible plastic one!). Also add the oil/juice remaining in the pan left over form baking. Combine the tomato juice and lentils. You can leave your soup this way and have a textured soup, or you can do as I do and puree the soup with a hand held cuisnart. When mixture is smooth, add salt and pepper to taste, and finely chopped fresh basil, stir in and serve. Garnish with a dash of fresh cream. This entry was posted in E A T and tagged cook, eat. Thanks for this Kirsten …. our family is “going vego” next week – while I have the week off – and we are doing lots of gardening, baking and cooking while I am home … we are mostly hoping that the weather is good so that we can spend time outside working on our garden! 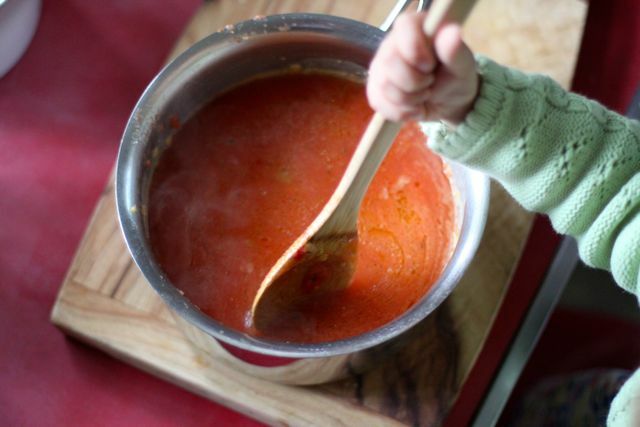 Lentil and Tomato soup is going to be on our list of recipes to try … I have made a point of looking back through your recipes for ideas!! Will keep you posted about how we go!